BEIJING, China, April 14, 2010 (ENS) – An estimated 700 people are dead and 10,000 others are injured in a 7.1-magnitude earthquake in the remote mountainous Tibetan Plateau of southwest China early Wednesday morning. The quake turned houses into rubble and cut off power supplies in Gyegu town, near the epicenter of the quake in the Tibetan Autonomous Prefecture of Yushu (Tibetan-Kyigudo) in southern Qinghai Province. Landslides have buried roads, making it difficult for search and rescue teams and aid supplies to get through. Without machinery from the outside, rescuers have had to dig with bare hands or iron sticks Wednesday, searching for survivors buried in the rubble. Rescuers have set up more than 40 tents for survivors, “But the effort seems far less than enough for the area inhabited by some 100,000 population,” according to the official state news agency Xinhua. Gyegu is the seat of the Yushu prefecture government. The town has a population of about 100,000, including permanent residents and nomadic migrants. Survivors are waiting for help in freezing conditions at an altitude of above 4,000 meters (13,000 feet). “I can see injured people everywhere. The biggest problem now is that we lack tents, we lack medical equipment, medicine and medical workers,” Zhuohuaxia, a publicity official in Yushu, told Xinhua. More than 85 percent of the houses in Gyegu, almost all made of wood and earthen walls, had collapsed, he said. The Dalai Lama Tenzin Gyatso, the exiled Tibetan leader, said from his home in Dharamsala, India that he is “deeply saddened” and is praying for the victims. In New York, UN Secretary-General Ban Ki-moon and General Assembly President Ali Treki voiced sadness after learning of the deadly earthquake. Ban said in a statement released by his spokesperson that the UN is ready to provide assistance to the Chinese government if needed. “The Secretary-General recognizes the efforts being undertaken by the Government of China to assess the situation and to assist those affected by the earthquake,” he said. President Hu Jintao and Premier Wen Jiabao have ordered local authorities to spare no effort to assist earthquake survivors. The State Council of China has set up a quake-relief headquarters, headed by Vice Premier Hui Liangyu, to handle disaster relief, epidemic prevention, seismic monitoring and public security. Hui has traveled to the region “to comfort local people and supervise the disaster relief work,” Xinhua reported. 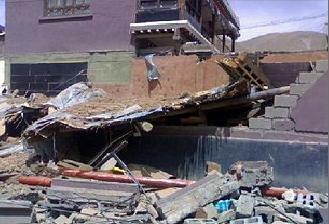 The provincial government of Qinghai also has begun emergency response efforts. Radio communication has been restored to Qinghai’s Batang airport, and the airport is operating on an the emergency power supply system, the Civil Aviation Administration of China confirmed late Wednesday. The Ministry of Railways said the Qinghai-Tibet Railway was not damaged and is in good working order, with the quake’s epicenter 362 kilometers (225 miles) away from the rail line at the nearest point.